The Koch brothers’ astroturf operation, Americans for Prosperity (AFP), and Wisconsin Family Action (WFA) are exuberant over Brian Hagedorn‘s apparent razor-thin victory over Lisa Neubauer on Tuesday for a seat on the Wisconsin Supreme Court. If the Kochs’ Hagedorn is elected, the Wisconsin Supreme Court will move one seat further to the right with a 5-2 majority. Hagedorn’s biggest supporter in terms of money was the Republican State Leadership Committee (RSLC), which took out $1.3 million in TV and digital ads. The RSLC funnels millions in corporate money into state campaigns, and counts tobacco companies, the US Chamber of Commerce, the Judicial Crisis Network, pharmaceutical giants, and Koch Industries among its top funders. “There’s no question our engagement made a huge difference,” Bott said. WFA spent more than $25,000 on mailings and brochures for Hagedorn as well. WFA thanked AFP for its efforts and extended “a hearty congratulations and thanks to Brian and his family for their hard work and steadfast commitment to staying the course despite the unjust attacks on their personal lives and their religious beliefs,” in a press release following the election. 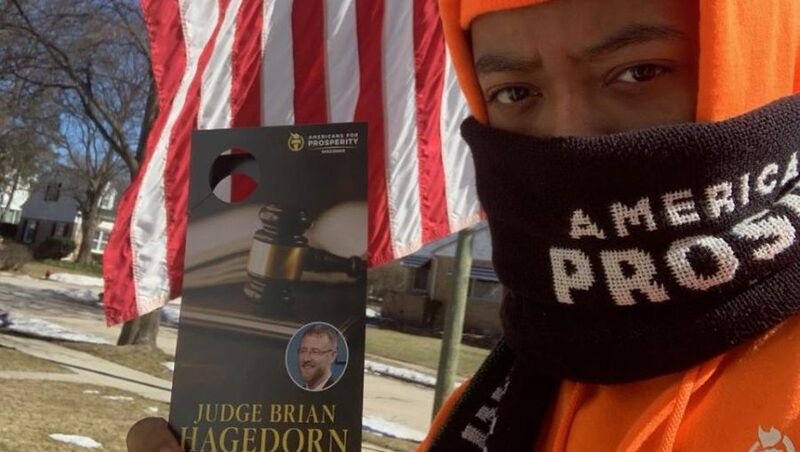 Hagedorn and other influential right-wing leaders in the state, such as Wisconsin Institute for Law and Liberty’s Rick Esenberg, framed the anti-LGBT Hagedorn revelations as attacks on “religious tolerance.” Esenberg, who donated to Hagedorn, regularly brings cases in front of the Wisconsin Supreme Court. Two hours prior to polls closing, WFA attempted to motivate Twitter followers by adding that Neubauer was endorsed by “pro-abortion” Planned Parenthood and “pro-LGBT” Human Rights Council. WFA has been active in pushing a Christian Right agenda in the state for years, as the Center for Media and Democracy (CMD) reported last year in Conquering the Courts: The Religious Right’s Fight to Rig the Rules and Undermine Judicial Independence. WFA is an affiliate of the Family Policy Alliance, a national network of 40 groups in 38 states that spends millions to influence state legislation and elect socially conservative candidates. WFA also played a big role in former Governor Scott Walker’s dark money operation in 2011 and 2012, channeling $1.2 million in cash from Wisconsin Club for Growth and Citizens for a Strong America into recall elections. The reason these statewide races are often so close is due to the fact that “liberal” (by comparison) candidates aim to sway many of the same voters as their reactionary competition, and in doing so, convey a “pragmatic” message that fails to motivate the unengaged or disillusioned to come to the polls.